When you think of it, there can be thousands of possibilities for how to set up your stuff at home. 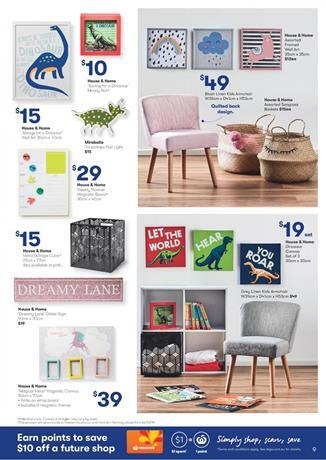 Alternatives are all around but one of the best ones are available in the Big W Catalogue home sale. A cosy home may also have an aspect of aesthetics in terms of decorative accessories. You don't need exaggeration but you can be aware of what can embellish your walls. Canvas prints are pretty popular things in many cases. If you have a family house, consider getting some of those just to add some colour. Also, they don't need to be useless while looking good. House & Home metal storage cube seems to be a very nice piece of furniture. Grey Linen kids armchair will cost only $49. Many more than that are available in the latest Big W Catalogue. Sleepy kids will find wonders in the catalogue. K-D 180 thread count sheet, Harry Potter Hogwarts range of quilts are also in the catalogue. Buy Disney Frozen sleepwear for kids. Bring some fun to your house with the devices of modern technology. It's possible to buy a nice LED Smart TV of a popular brand, new video games for the console, and bundle prices. 15% discount on App Store & iTunes gift cards. Buy also Nintendo games like Let's Go, Eevee! Sony's 43" LED 4K Smart TV is a new product at Big W. Buy it for only $849 saving $100. Don't forget to see the latest catalogues that contain similar products. You can compare the items, follow our Facebook page, subscribe to get the newsletter to your email. Casual, comfortable, high-quality fabric kids clothing deals are available in the Big W Stores. See all the prices of Brilliant Basics, B Collection products for kids. Big W Catalogue offers such a good range of clothing products. You will feel comfortable letting your kids choose whatever they want to wear. It's very safe to do that at Big W. Lower prices for everything is making this shopping easier than it is. Also, you will get free delivery when you spend $50 on footwear&fashion accessories. A tricky part of this trade is about baby clothing. Buying some clothing products for babies is really easy but the tricky part is that you don't know if the prices are right. Big W collection of baby wear is available on pg 7 and they made that page with only the best prices. Follow the Facebook page where you can see these posts on your feed. Alternatively, subscribe to the Big W Catalogue to get emails. Barbie 60th year anniversary toys are all around the world. Amazon, Target, and many more major retailers in the world has this collection right now. 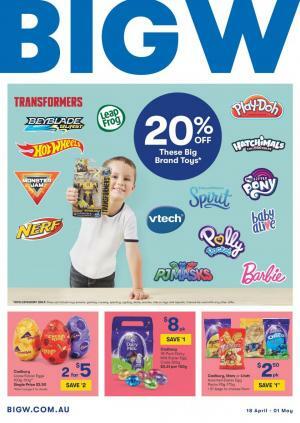 Big W Catalogue has also a place in the new sale for Barbie dolls. This is the biggest event of toy sale from the Big W stores. You can find new toys with new stories. Promotion prices are available and Barbie sleepwear is one of the best things from pg 2-3 of the latest Big W Catalogue. If you are a fan of Barbie products, you can also decorate your place with a lot of toys or Barbie accessories. Wrapping packs of Barbie can also be a thing for you. Browse Barbie DVDs that are BOGO Free deal this week. Fairytopia & A Fairy Secret, Mermaid pack, and more are on pg 3. Barbie toys are only a part of the catalogue. LEGO Movie 2 Toys will also be in the new sale of Big W stores. Emmet and Benny's build and fix, Benny's space squad are two of the LEGO toys. They are new ones from the toy sale. Collectible toys like LOL Surprise, Shopkins, Spirit, My Fairy Garden, and more LEGOs on pg 4-5. All day long I dream of only one thing. Watching a great movie in my own place with a great quality of TV and sound system. That's the only way to escape from reality of annoying daily life. EKO and JVC soundbars and LED smart TVs are available on the latest Big W Catalogue. A decent quality of a smart TV must suffice but there is always a better version of the entertainment of watching a great movie. Upgrade your indoor technology for a better quality of Blu-Ray movies. You might be tired of going to the theatre for movies. There are now many alternative ways to watch a new movie that is made by Netflix or Amazon. Youtube also offers a premium service which you can use to watch the movies for a fee. So, you'll be able to watch films like Roma, which is the best foreign film of the year in the Academy Awards (Oscars) this year, as soon as possible. It's a Netflix original directed by Alfonso Cuarón. Buy a TV with a Big W tv sale price on the latest catalogue. They are available on pg 29. More electronics and related-electronics are also available in the last sale. Don't forget to see all the products of the online catalogue. Pyjama sets, women's scuff slippers, Batman coverall, slipper boots, and more for kids and grown-ups are available in this part of the Big W Catalogue. Featuring the best alternatives and a great price range for you, Big W Catalogue is one of the most useful sources of nice deals this week. Enjoy the Superhero costumes and create your own stories with high-quality material. All you need to do is to check out the low prices of Big W on pg 8-9. Also, price drops on casual clothing items such as long sleeve print tees, sweatshirts, boots are a part of the catalogue sale. Online savings can do a really good job if you want to lower the costs of shopping for apparels. B Collection girls clothing range, plain tees, trackpants and more on sale. Big W can renew your entire wardrobe at lower costs in the kids' wardrobe sale.